The day dawned with blue sky and sun. 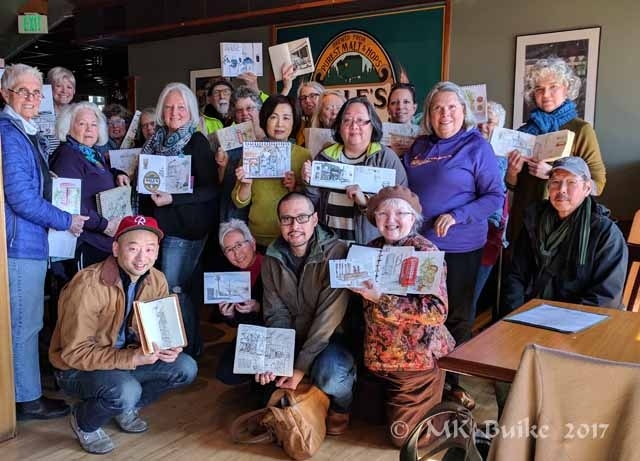 At first, I thought I would leave extra early for our 11am sketch outing so I could do another sketch of the Fremont Troll on my way to the sketch venue. Then I looked at the temperature... 32 degrees. Even though it was much warmer in the afternoon on my way homeward, I didn't stop as I wanted to beat the Sounders traffic. 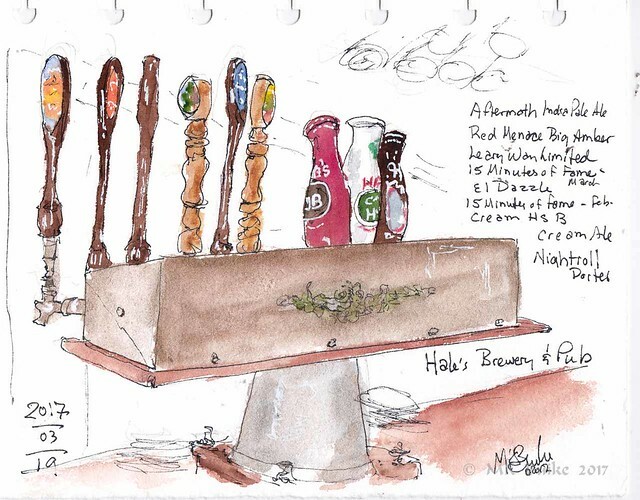 We met a little later than usual so as to sketch at Hale's Brewery and Pub, which opened at 1100. 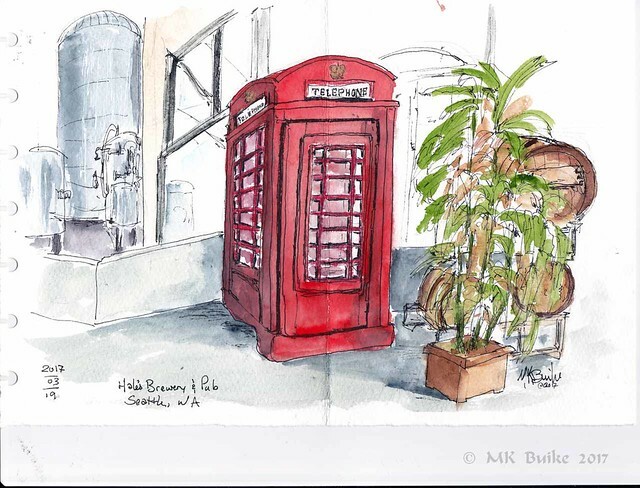 From looking at photos on-line, I knew I wanted to sketch the red English telephone box. It was a popular subject today. By then, it was 12:30, with still an hour remaining. I decided to have some lunch while I sketched the taps in the bar. The names of the brews were unusual: Aftermath India Pale Alre, Red Menace Big Amber, Leary Way Limited (The brewery's address is Leary Way), Nightroll Porter. 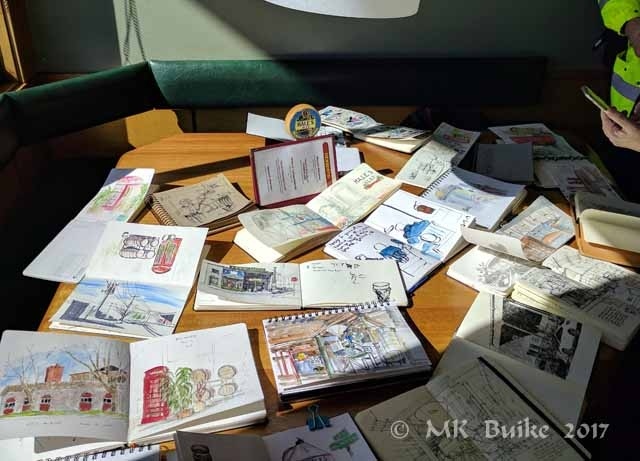 We shared our sketches and had our group photo in the dining room. We were 22 people today. One is missing from the photo (Vivan's nephew). Once home, my husband said I smelled like a brewery. He has been an accomplished brewer, so he didn't mean I smelled of alcohol, he meant I smelled like wort (a liquid in the stage of brewing). I'd sketched for an hour in the lobby which is open to the brewery.